Near-shore fishing requires the use of boats and larger, stronger nets than the inshore fisheries. 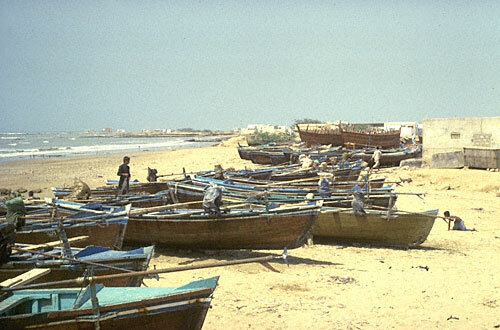 The Baluchi boats are stylistically different from the Sindhi boats. Abdur Rheman Goth, the Baluch village where I lived, is surrounded by Sindhi villages. Each village has its own grounds that they fish in with some of yet they cooperate and fish in different fishing areas. This photograph depicts the late afternoon in Abdur Rheman Goth when all of the boats have been hauled up on the beach for the evening. This allows the fishermen to protect the boats if an evening storm comes in. During the fall of 1993, such a storm hit the beaches of Buleji (the region where Abdur Rheman Goth sits) forcing the fisherfolk to quick action and haul the boats up shore before they could be swamped!